Israel’s Rafael Advanced Defense Systems Ltd. has unveiled a new version of its Spike missiles – the Spike non-line of sight (NLOS) missile. Israel’s Rafael Advanced Defense Systems Ltd. has unveiled a new version of its Spike family missiles – the Spike non-line of sight (NLOS) missile. The Spike missiles, some which are already being used by the IDF, are electro-optical multi-purpose missiles, and are considered the most advanced missile of their kind in the world. They are third-generation anti-tank guided missiles, which work as a “fire-and-forget” missile with lock-on before launch and automatic self-guidance. 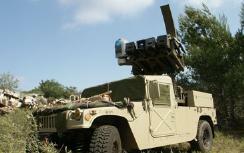 The new Spike NLOS missile has a range of up to 25 kilometers (15 miles) and can be used from the air, land and sea. It has a unique ability to damage even targets that are located out of view of the missile launcher. The older versions, with a range of only range 4-8 kilometers, are used by infantry forces, and can be fired by helicopters and ground vehicles. The Spike NLOS can be used during the day and night, and like the previous versions, the launching system works as a fire-and forget, enabling independent homing after launch without operator interference. The missile, using fiber optics, is able to update data while it’s flying in the air on its way to its destination. This unique technology also allows, if necessary, a change in course to avoid missing its target or harming innocent targets.